..and I'm addicted to desserts. The "Nads" in Nads' Bakery is pronounced "NODS". It's a nickname my friends gave me. And, yes, I do know what nads refers to! But it got your attention didn't it?! 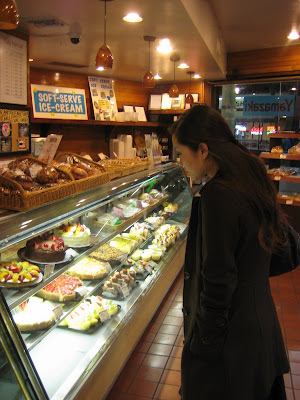 My love for pastries came about when I was in college. Although, looking back at my childhood I do remember baking a lot of brownie and cake mixes. During my final years at UC Riverside in California I was finishing my bachelors degree in Liberal Arts with an Emphasis in Math and a Minor in Education: I thought I wanted to be a teacher. After doing some field work I realized teaching wasn't for me. At the time I baked cookies mostly with the occasional cake mixes for birthdays. When I thought about what I wanted to do now that I had no direction in terms of career I casually thought about culinary school. I looked up some schools, one of which was the Le Cordon Bleu culinary school in Pasadena. Next thing I knew, I was enrolled as a pastry student at the California School of Culinary Arts. For the next 8 months I went to school 6 days a week commuting from Orange County building the basic foundation for all things pastry. I loved EVERY MINUTE OF IT!!! Waking up at 3:45AM every morning for the 40 minute commute to be the first to arrive for our 6AM class. I miss those days..
After graduating, I got my first job as a pastry cook at a local restaurant that was really popular for the desserts. Everything I learned from culinary school was cemented during my time there. Unfortunately, I developed a severe case of tendonitis in my wrist and was forced to rest. My hiatus was only intended for a few months but it never really healed and I was forced to look for a job elsewhere.. doing something other than what I loved doing. Through God's amazing grace I found an admin assistant job on Craig's List for a restaurant consultant whose company is called Chef Innovations. While majority of my work consists of admin work, I've picked up food photography which I use for some of our clients and I am still around everything food related... with the occasional dessert item that I get to develop for clients. The more and more I delve into the wide world of pastries, the more I realize how little I know. I'm overwhelmed at times about the things I don't know but one thing I do know for certain is that I love desserts. My intended audience for those who read my blog are fellow bakers, pâtissiers, pastry cooks, novices.. or anyone who enjoys looking at pictures of food with the occasional or frequent attempt at baking. All in all, I love food, I love taking photos, and I love sharing both. I'd love to hear your thoughts or any tips/suggestions so please feel free to leave me a comment. wow! I really thought that was your bakery, lived in Uk for 5 years, never been to such amazing places. Haha! I wish it was! Amazing... but you are still baking (regarding your injury).. I guess you just can't do it as a profession but no problem with home baking? You do take really nice photos btw. Hi, Nadia I can't find contact info for you and I want to feature a recipe from your blog on a website.